We know that paper isn’t ever going to disappear completely. Organisations will always need physical documents such as invoices, purchase orders, sales reports, quotations, estimates and other high-volume forms. However, many stationery cupboards are filled or overflowing with forms that might suddenly become obsolete (or, worse, might run out when they’re needed). DocuSmart Output makes it easy to create these documents straight from your DMS, and then either email, fax or file them away for easy retrieval. How does DocuSmart Output work? DocuSmart Output automatically captures raw print data from your dealer management system and converts it into well designed documents. Forms, invoices or purchase orders – the possibilities are endless with DocuSmart Output. The information you need is already in your dealer management system – we just clean it up for you. Documents always follow the corporate style guide and look highly professional. . The system’s variable data capabilities allow the printing of sophisticated forms merging variable text and images, allowing you to match your offer to your customers’ profile. DocuSmart Output gives you a whole new flexibility. Forms can be printed in a range of languages, including East Asian languages. Different logos can be used for different parts of your business. We eliminate the need for pre-printed stationery and reduce your paper usage altogether. Once forms are created, distribute them by fax, email or file away for later use. DocuSmart Output works seamlessly with DocuSmart Archive, automatically indexing documents using defined values such as invoice or order numbers. 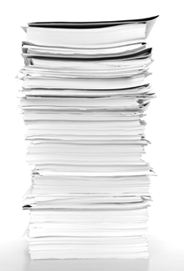 With DocuSmart Output, you won’t be tossing out stacks of old forms every time they need to be revised - saving you printing, distribution costs and paper. Digital documents can be distributed in a number of formats including PDF, TXT, CSV, XLS, HTML and XML. The automated print module prints to all Windows based devices including laser, inkjet, thermal, dot matrix and till slip. And DocuSmart Output works seamlessly with existing ERP, financial and business applications. The flexibility and the organisation that DocuSmart Output lends your business can change the way your entire accounts department works. So while DocuSmart Output might never completely eliminate paper, we make sure you use far less of it, and never waste what you do use.